YALTA, Crimea -- Russian President Vladimir Putin on Monday slammed alleged "external control" over Ukraine's government as he made his third visit to the Crimean peninsula since Moscow seized the region from Kiev last year. Russian President Vladimir Putin (C) chairs a session of the State Council's Presidium in the Crimean city of Yalta on August 17, 2015. "It will leave behind this shameful practice... that is placing the whole of a huge European country under external control with key positions in the government and regions filled by foreign citizens." "I think this is humiliating for the Ukrainian people," the Kremlin strongman said. Ex-Soviet neighbours Russia and Ukraine are locked in a bitter feud over Moscow's annexation of Crimea and the Kremlin's alleged fueling of a separatist conflict in eastern Ukraine. Russia has claimed the West was behind popular protests that led to the February 2014 ouster of former Ukraine president Viktor Yanukovych. Ukraine in December appointed a new pro-Western government that included American, Georgian and Lithuanian citizens. Finance Minister Natalie Jaresko is an American citizen of Ukrainian origin who once worked at the US State Department. Flamboyant former Georgian president Mikheil Saakashvili, who once fought a brief war with Russia, has been appointed as head of the strategic Odessa coastal region. 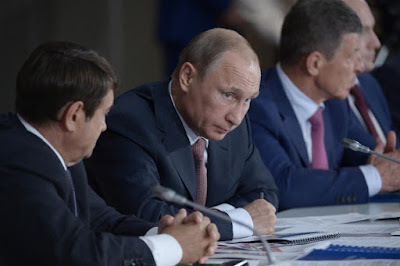 Putin held a government meeting in the Crimean city of Yalta to discuss the stuttering economic development of the peninsula under Moscow's rule. The region is under tough Western sanctions that have seen its banking system hit and foreign firms pull out. Tourism, a mainstay of the region's economy, has also plummmeted. Putin's visit to Crimea sparked ire from Kiev with Ukrainian President Petro Poroshenko describing it as a "challenge to the civilized world". "These trips mean further militarisation of the occupied Ukrainian peninsula and lead to its greater isolation," Poroshenko said in a statement on his Facebook page.